SegaCD Sonic the Hedgehog CD (JPN/USA) in 17:04.27 by marzojr. 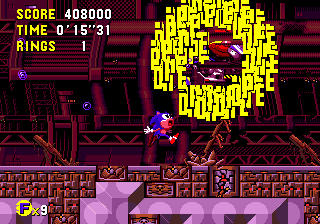 Sonic the Hedgehog CD was developed to showcase a new Genesis/Mega Drive peripheral, the Sega CD. The game is markedly different than other Sonic games; aside from "improved" graphics and sounds, each level has 2 to 4 alternate versions that correspond to different time periods. Sonic can move between them to affect the gameplay and ending. This run is 31.53 seconds faster in in-game time than nitsuja's run thanks to various optimization and minor route changes. For more information on the improvements, please read the author's submission notes. There are two sets of encode files, the first recorded with the American region music and the second with the Japanese region music. There is also a run of Sonic the Hedgehog Megamix played as Sonic on his SegaCD version. We also have movies in Sonic the Hedgehog, Sonic the Hedgehog 2 and Sonic 3 & Knuckles.